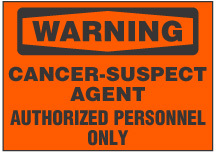 The danger sign indicates the presence of benzene, a cancer hazard. There is no smoking permitted and only authorized personnel permitted. 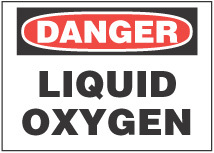 A Respirator is required. 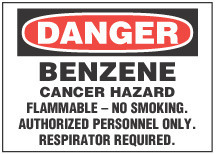 Legend: DANGER, BENZENE, CANCER HAZARD. FLAMMABLE - NO SMOKING. AUTHORIZED PERSONNEL ONLY. RESPIRATION REQUIRED.